When you want to do some data processing / analyze in your report data in Excel format, your converted or saved excel report should have proper formatting. For example, excel should not have any merged cells which will make lots of issues when you do analysis / processing your data and look and feel of the report also won’t be good . Deski and Webi reports are having different excel format converting methodologies and both type of report Excel conversion will be different for Local file save and scheduled excel files. In Deski, reports are converted as is (same as in the report structure) to Excel format which may have Merged Cell if the report structures are not properly aligned. Below shown report structures are not properly aligned, means Sales report table heading width is not ending with any of the cell width in the table. Report having multiple tables and those tables cells width are not aligned with each other. Below circle mark shows how the 2 table start points and each cell width are different. 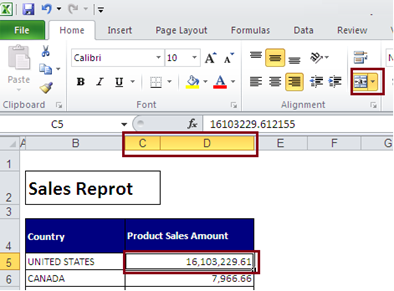 These kinds of reports will cause merge cell issue while converting / saved to Excel format. Below is screen how these report will look when you convert / save them in excel. The same merge cell format will be converted when you schedule the Deski report. 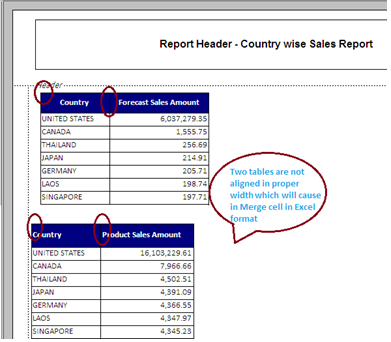 To avoid merge cell issues, report should be designed properly by aligning / adjusting the table cells / cells width. Each report header cell width should be started / ended with any of the table cells width, Means report header cells width should be aligned with table cells width. Report header cell width should not start / ended in between any of the table cells width. Multiple tables are there, again each table cells width should be aligned with other table cells width and should not start / end in between. If the above reports converted into excel there won’t be any merged cell issue in the Excel format. 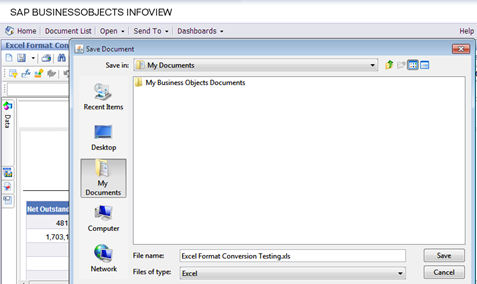 Webi reports are having different methodologies while converting / saving Webi reports into Excel formats. While saving the Webi Rich client report into Excel format Webi report would ask to select options how you want convert your excel report. Prioritize the format of reports in excel document – When you select this option report will convert as is in the Webi format (most likely same as in Deski report to Excel conversion) and if the report structures are not aligned properly then that report would have merged cell issue. 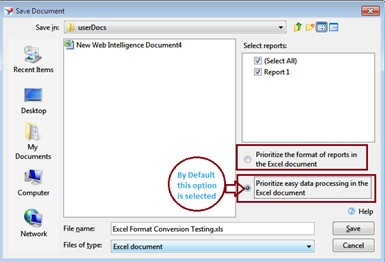 Prioritize easy data processing in the Excel Document – In Webi Rich Client / Webi thin client reports when you select save as Excel this option selected as default. When this option selected the report will convert in proper excel format to do data processing and it will not have any merge cell issue even if the report structures are not aligned properly. Note: When you schedule the Webi reports by default it will convert the proper Excel format (Prioritize easy data processing in the Excel Document).